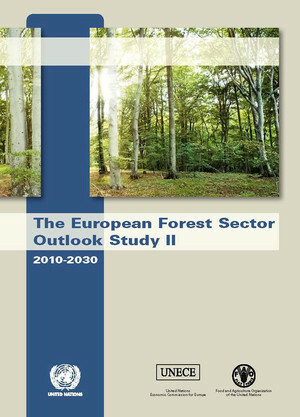 The European Forest Sector Outlook Study II (EFSOS II) is the latest in a series of studies, which started in 1952, to provide a regular outlook report for the European forest sector. All these studies have aimed to map out possible or likely future developments, on the basis of past trends, as a contribution to evidence-based policy formulation and decision making. A reference scenario and four policy scenarios have been prepared for the European forest sector between 2010 and 2030, covering the forest resource and forest products. The scenarios are based on the results of several different modelling approaches, and in particular of econometric projections of production and consumption of forest products, the Wood Resource Balance, the European Forest Information Scenario model (EFISCEN), the European Forest Institute - Global Forest Sector Model (EFI-GTM), and competitiveness analysis. The four policy scenarios (Maximising biomass carbon, Priority to biodiversity, Promoting wood energy, Fostering innovation and competitiveness) help policy makers gain insights into the consequences of certain policy choices. These choices are assessed according to their sustainability and recommendations are proposed based on the trade-offs facing policy makers. Decision makers are encouraged to reflect upon these analyses and to consider them when taking possible future policy actions.